Umm, OK, hmmm..I'm trying to think of a good way to put this without being to impetuous. Cheesecake. Pops. Rule. There aren't many things I'll eat off a stick but I can easily have these for breakfast, mid morning snack, lunch, mid afternoon snack, dinner, and obviously dessert. These little balls on a stick were lights out. I joined Daring Bakers, an online baking community in which I referenced here, this month and unfortunately was unable to make the challenge of an opera cake. However, I wanted to make up for it by making last month's challenge, cheesecake pops! These were ridiculously fun to make and, although a 2 day process, were fairly easy. They are a great summer treat to bring to a BBQ and allow for much creativity. Have you ever had the classic Carvel vanilla soft serve with that awesome chocolate hardshell? Yes? No? Maybe? Well that's what these taste like only with a cheesecake kick! I used cookie cutters to create the shapes of hearts, flowers, balls, and bells. You can be creative and use whatever you'd like- or you can just roll the ball shapes with your hands. Make these!! Let me tell you the first rule about baking desserts using lemon. You have to ask yourself if the juice is worth the squeeze; and in this case, it most certainly is! Lately, I've been making a lot of recipes that involve the rind and juice of a particular fruit (i.e lemon and lime) and I can't stress to you how important it is to make sure you use quality fruits. It's almost pointless and a total waste of time to go through an entire recipe using store bought lemon juice or something of that nature. If you're going to cook/bake using lemon juice, please please please juice the lemons yourself--you'll thank me in the end! Also, if you have Meyer lemons readily available to use, definitely use those--they are the most tart and flavorful. My favorite part about these bars is how mysterious they are. Nothing about these resemble lemon bars and one's taste buds are in for a real surprise! They blow people away. I mentioned in an earlier post found here, that my mother has been gradually sharing her most sacred recipes with me. These lemon bars, she claims, is the best recipe to date! They were AMAZING! They have a shortbread crust with a pecan pie type of filling (think brown sugar gooeyness) that contains both pecans and coconut with a lemon drizzle on top. I made a few mistakes that I actually think worked in my favor. First off, I doubled the coconut by accident because I was distracted. I'm a huge coconut lover so this mistake clearly didn't bother me! My other mistake was that I put the lemon-sugar drizzle on top before I baked the bars leaving a lemony crunchy crust atop. Again, I loved how they came out! Next time I will put the glaze on after they are baked and have it drizzle down the sides. This recipes uses the rind of 5 lemons...yes, you read that correctly, 5 lemons! They were so tart and delicious! My boss is a huge lemon-dessert fan and he rated these top 3 greatest desserts I've made thus far! Unfortunately, again, I cannot expose this recipe to the public because my mother just might have me killed. I feel like such a tease! She made me swear before giving me the recipe that I wouldn't post it! I promise I'll go back to posting recipes that can be revealed! OK, I'm spiraling out of control with all of these online interactive baking clubs. I have officially joined another one, called Daring Bakers, in addition to Tuesday's With Dorie. They are just so much fun and really encourage/challenge/give me the opportunity to bake recipes I'd never normally make. Lots of these recipes I never even knew existed! Each recipe I make bestows more confidence, leaving me with this overwhelming anticipatory feeling leading up to each new recipe reveal. Daring Baker's is different from Tuesday's With Dorie in that a recipe is revealed at the end of each month and you have 1 whole month to complete it. All the Daring Baker members post on the same date at the end of the month. I love being able to compare and contrast various creativity levels with the others. The recipes are all pretty challenging or, ah-hem, daring. Sooooo, I joined this group in the beginning of May and was unable to complete this month's challenge because I just ran out of time. The challenge was to make an Opera cake which is a 7 layer cake consisting of jaconde, buttercream, ganache, and glaze or mousse. Nothin' like leaving everything until the last minute, eh? This challenge is extremely involved and due to the lack of time, I fell short of this month's challenge. However, I decided to make April's challenge (Cheesecake Pops) to make up for my Opera cake absence; post to follow! Click here to see all the other fabulous Daring Baker's Opera cakes and past challenges! Melt chocolate according to package directions, taking care not to overheat. I melted the semisweet and white chocolate separately and then mixed together. To melted chocolate add peanut butter, sugar and vanilla. Mix well. Spoon or pipe (I used a decorating bag with a large round tip) chocolate mixture into small baking cups. Refrigerate until set. Enjoy! HOW 'BOUT SOME BROWNIE WITH THAT CHEESECAKE? My mother had a catering business for quite some time several years ago in which she kept all her "sacred" recipes in this little worn 4 by 6 red book that didn't leave her sight, ever. This book is filled with unbelievable recipes, most of which she created, that she has been using for years and is constantly adding to. When my love for baking began, my mother slowly, one by one, shared some of these recipes with me. Please note that she will not give me the book to follow the recipes; she will only photocopy the recipe for me because god forbid I lost or even stained the book she'd disown me. I knew I would be attending a few BBQ's this past weekend for Memorial Day and decided to make her Brownie Cheesecake recipe. When I scrolled down to the bottom and saw "serve frozen" I knew it would be the perfect treat for an outdoor BBQ in blazing heat. Well, it was just that...perfect! First, I made the brownie layer which ultimately becomes the foundation for this wondrous cube of greatness. Atop the brownie comes the cream cheese "filling" then capped off with chocolate ganache. Once cooled and ready to be cut up, I was totally floored when I saw how these came out. 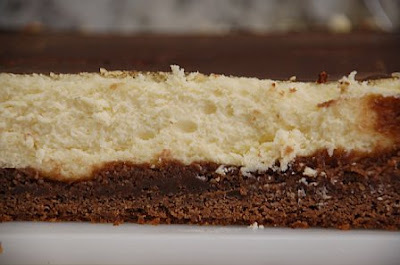 Before I put the pan in the oven, the brownie batter was pretty much equal to the cream cheese filling, however, once baked, the brownie layer became thin while the cream cheese layer expanded and set-making these bars 90% cheesecake 10% chocolate. These were so awesome! Serving them frozen was the absolute way to go and they were a hit at the BBQ! Unfortunately, I cannot reveal this recipe, as mentioned earlier, my mother will disown me. Enjoy the pictures! Sorry folks, but there won't be a TWD (Tuesday's With Dorie) posting this week. I quickly scanned the recipe yesterday thinking I could attempt to complete it, but I realized it's a 2 day process which seemed overly involved for me. I lacked both the time and the patience for the Pecan Honey stick buns chosen by Madam Chow, however, they do look delicious! You can find these sticky buns baked by other fellow TWD'ers here. I will be back in action next Tuesday for Dorie's French Chocolate Brownies! Mmmmm.. I LOVE cashews. Bottom line, they are my most favorite nut of all the nuts in the land!! I'm a total cashew freak. I keep salted cashews in my freezer at all times--they are so good super cold! When I saw this recipe on Bake or Break, I knew right away that I had to make them and they completely satisfy the requirements of my new finger food kick that I'm on. These contain the most perfect compliment of saltiness and sweetness-a combination that can't be beat. The crust is that of a very crunchy shortbread-type crust, topped with caramelized butterscotch and big salted cashews. These are very easy to make and require a very strong arm for cutting so make sure you save some energy for this portion! Again, I can't reiterate enough how delicious these are. The crust is super super crunchy and thick and the caramelized butterscotch is so sticky and sweet. If you like nuts half as much as me, you will go gaga for this recipe. Preheat oven to 350°. Spray a 9″x 13″ pan with cooking spray. Using two sheets of parchment paper, line the pan’s width and length, creating a parchment “sling.” Spray parchment paper with cooking spray. Using an electric mixer on medium speed, beat butter, brown sugar, and salt for 1 to 1 & 1/2 minutes. Decrease mixer speed to low and add the flour. Mix just until combined. Lightly press dough evenly into the prepared pan. Poke holes in the dough with a fork. Bake for 30 to 40 minutes, until the crust is a golden color. Remove to wire rack to cool. In a heavy saucepan over low heat, stir together butterscotch chips, corn syrup, and water. Stir until mixture comes to a simmer and butterscotch chips are melted. Pour over crust. Sprinkle cashews over the butterscotch caramel. Bake for 5 minutes. Cool completely on a wire rack. After cooling, remove from pan and use a very sharp knife to cut into bars. Makes 2 dozen 2-inch bars. There is something about cold, gloomy, ominous days that throw me into a crazy baking rage. I'm unstoppable on these types of days. Well, yesterday was just that kind of day. I go in stages with various sorts of baked goods. The last few months I was really into cakes, specifically layer cakes. I enjoy being creative with the actual construction and decoration of a layer cake. However, the flavor of this month are finger food type treats, such as cookies, brownies, bars, etc. Anything bite sized that doesn't require utensils is categorized as a finger food in my book. Form dough into balls using a spoon and place on cookie sheets (I lined with parchment paper). I formed little dough balls to create mini sized cookies, so use your judgement based on how big you want your cookies to be. Bake, reversing cookie sheets’ positions halfway through baking, until cookies are light golden brown and outer edges start to harden yet centers are still soft and puffy, 15 to 18 minutes (As you know, everyone's oven is different. I baked my mini's for about 11-12 minutes and they came out perfectly). Cool cookies on cookie sheets. Serve or store in airtight container. I realize today is Monday but I just couldn't wait until tomorrow to post. Plus, I'm not sure how much time I'll have tomorrow to do so, so here it is....(insert drum roll here)....Bill's Big Carrot Cake!! This week's entry for Tuesday's With Dorie was chosen by Tara of Smells Like Home and she chose Traditional Madeleines. However, because Madeleines require a certain type of pan (which I do not own), Laurie (who runs the group) suggested those who do not own the pan can make an alternative recipe from Dorie's book; as long as the recipe has already been used for the weekly entries. I knew right away that I wanted to make this carrot cake. I joined 1 week too late to participate in this carrot cake's entry week so I figured I would make up for it this week, as long as I had the opportunity to choose among several already baked recipes. This was my first carrot cake. I've never even baked anything involving a vegetable. Well, let me just say that this cake was off the charts, hands down, out of this world, unbelievable. I've always loved carrot cake. I think my love for carrot cake began when I was 13 and my mother insisted upon making my Bat-Mitzvah cake a carrot cake. It was an enormous sheet cake with gorgeous marzipan decorations throughout with silky,buttery cream cheese frosting. After that, carrot cake was always my first choice. Rather than making this cake in 3-9 inch round pans (which is what the recipe called for), I opted for 3-6inch rounds and 1 standard size cupcake tin (12). I only ended up using two of the 6inch rounds and sliced each one in half, creating 4 layers. I frosted the middles, sides, and top, piped orange colored shells around the top and bottom, and using decorating tip #3, designed a carrot on top. If you were wondering what I did with the 3rd cake round, I wrapped it up and froze it for the future. I swirled the cream cheese frosting on the cupcakes and topped it off with yellow sugar crystals. If I haven't yet made it clear enough, I LOVE THIS RECIPE! These flew off my desk at work at an exponential rate as the day went on. Whisk the flours, baking powder, baking soda, cinnamon and salt. In another bowl, stir together the carrots, chopped nuts, coconut, and raisins. Here's a shocking development for you folks....I made yet ANOTHER recipe from Dorie Greenspan's book, "Baking: From My Home To Yours". If this blog and it's respective detailed pictures do not heavily encourage you to buy this book then I really don't know what will. Let me reiterate, BUY THIS BOOK! OK, enough of a sales pitch outta me. Oddly enough this is my first batch of blondies, ever. I've baked several different types of chocolate brownies, but never blondies; which is why this recipe caught my eye. As I skimmed the ingredients portion of this page, my eyes immediately locked in on heath bar bits. It was that moment that I decided to make these; love at first sight. These blondies were loaded; coconut, heath bar, chocolate chunks, and walnuts. I loved the addition of the coconut as it really gave these squares a sticky consistency while also having the crunch from the heath bar, chocolate chunks, and walnuts. I will definitely be making these again; perhaps interchanging white chocolate chunks and/or Butterfingers. You can also substitute the walnuts for a different kind of nut that suits your palette. The brown sugar and heath bar combination are so tasty. When I took these out of the 9X13 inch pan and before cutting them up into squares, I went around the entire perimeter with a knife and thinly sliced off the ends. I noshed on these as I finished up and they were the best part! They are very chewy and satisfying. I bagged up the ends and put them in my freezer for a rainy day. Getting ready: Center a rack in the oven and preheat the oven to 325 degrees F. Butter a 9x13-inch baking pan and put it on a baking sheet. Working with a stand mixer, preferably fitted with a paddle attachment, or with a hand mixer in a large bowl, beat the butter on medium speed until smooth and creamy. Add both sugars and beat for another 3 minutes, or until well incorporated. Add the eggs one by one, beating for 1 minute after each addition, then beat in the vanilla. Reduce the mixer speed to low and add the dry ingredients, mixing just until they disappear into the batter. Using a rubber spatula, stir in the chips, nuts, and coconut. Scrape the batter into the prepared pan and use the spatula to even the top as best as you can. Bake for about 40 minutes (mine took about 35 minutes), or until a knife inserted into the center of the blondies comes out clean. The blondies should pull away from the sides of the pan a little and the top should be a nice honey brown. Transfer the pan to a rack and cool for about 15 minutes before turning the blondies out onto another rack. Invert onto a rack and cool the blondies to room temperature right side up. Cut into 32 bars, each roughly 2 1/4 x 1 1/2 inches. One of my closest, dearest, oldest friends is celebrating her birthday today! Let me take a moment to wish her a Happy Birthday J!!!!!!!! In celebration of her 26th birthday, of course, I baked her a birthday cake. I am so enamored by Dorie Greenspans, "Baking: From My Home To Yours" (I mention this book in most of my posts) that I decided to make Dorie's "perfect party cake". This is a recipe I've been wanting to try for quite some time and I know J will love it. It's, er, um, perfect. I have yet to make a cake like this one. Whenever I think of birthday cake a yellow cake with loads and loads of vanilla and/or chocolate frosting (from the can) with some sort of sprinkles comes to mind. Don't get me wrong, birthday cake like that is absolutely delicious and makes me feel like a kid again but this "perfect party cake" is in another league. This "perfect party cake" takes the cake, no pun intended. It is a more sophisticated classy kind of birthday cake suitable for the elderly; and by elderly, I mean 21+(or something). Anyway, this cake has very interesting twists to it. The actual cake is very light and fluffy with various intimations of lemon while the filling consists of the silkiest, smoothest lemon buttercream atop red raspberry preserves. The entire cake is then doused in buttercream and topped off with sweetened coconut. Seriously, this was awesome and so divergent. It was a pretty big project to take on but it was well worth it. Sift together the flour, baking powder and salt. Whisk together the milk and egg whites in a medium bowl. Put the sugar and lemon zest in a mixer bowl or another large bowl and rub them together with your fingers until the sugar is moist and fragrant. Add the butter and working with the paddle or whisk attachment, or with a hand mixer, beat at medium speed for a full 3 minutes, until the butter and sugar are very light. Beat in the extract, then add one third of the flour mixture, still beating on medium speed. Beat in half of the milk-egg mixture, then beat in half of the remaining dry ingredients until incorporated. Add the rest of the milk and eggs beating until the batter is homogeneous, then add the last of the dry ingredients. Finally, give the batter a good 2- minute beating to ensure that it is thoroughly mixed and well aerated. Divide the batter between the two pans and smooth the tops with a rubber spatula. Bake for 30-35 minutes, or until the cakes are well risen and springy to the touch – a thin knife inserted into the centers should come out clean. Transfer the cakes to cooling racks and cool for about 5 minutes, then run a knife around the sides of the cakes, unfold them and peel off the paper liners. Invert and cool to room temperature, right side up (the cooled cake layers can be wrapped airtight and stored at room temperature overnight or frozen for up to two months). Peanut butter. Chocolate. Muffins. Oh how I love to tag the word "muffins" to the end of this recipe thus allowing for an appropriate breakfast food. The moment you add the word muffin to any chocolatey recipe it automatically holds connotations of breakfast and early morning food, making chocolate OK forenoon. That notion works for me. I grabbed this recipe from Bake or Break and it is originally adapted from Nestle's Very Best Baking. The batter is your typical chocolate muffin/brownie batter put into muffin tins, filled with warm peanut butter, then topped off with peanut butter and chocolate chips. In addition, peanut butter and chocolate chips are mixed throughout the batter making for a chocolate peanut butter overload explosion. Once the batter is put into the tins, baked, and taken out of the oven, the center of the muffin collapses upon cooling. Once this happens, a large dollop of warm peanut butter is inserted into the centers followed by a sprinkling of peanut butter and chocolate chips. This recipe yields 12 regular sized muffins, however, I made 6 large (not jumbo) muffins and they came out delicious. Next time I think I will stick to the regular size muffin tin as I had to cut my large muffins in half to serve because they were very rich. Regular size, or even mini muffin size would be more suitable, especially for a breakfast treat! These were so simple to make and if you enjoy a crunchy crust with a gooey soft inside then I highly suggest you make these! Preheat oven to 350°. Spray or grease 12 muffin cups. Well, it's Tuesday and that means it's my day to post for Tuesdays With Dorie. This week's recipe was chosen by Dianne of Dianne's Dishes and she chose Florida Pie. Let me just say how excited I was when I saw this selection. I've felt compelled to make a Key Lime (or in this case, Key Lime-ish pie combining lime and coconut) for quite some time and now I had the perfect excuse. I knew I would be going home last Sunday for Mother's Day and my father's absolute FAVORITE dessert would have to be Key Lime pie, no doubt about it. I knew he would be the perfect taste tester considering he's such a Key Lime pie connoisseur and that I'd embrace his criticism with open arms. Whip the cream with the confectioner's sugar and vanilla and spread on top of pie. SO YOU'RE SAYING IT'S A COOKIE, ON TOP OF A BROWNIE? I was up early on Saturday and got a lot of my errands and the gym done before noon, which, by the way, is an extreme rarity for me considering I don't open my eyes until at least noon on a weekend--and by at least, I mean more like 2pm. Yes, I heart sleep. Since I got the puppies, however, I have been up super early so I'm able to get up and get out at a decent time leaving me lots of free time in the late afternoons to experiment and bake. On Saturday, I baked my Tuesday's With Dorie entry for this week which involved lots of freezer time so I thought I'd make something while I waited for my pie to set. I figured since I already had Dorie Greenspan's book ("Baking: From My Home To Yours") open on my countertop I would look through the "Cache of Cookies" section. As I flipped through, I came across Chipsters, as pictured above and below. Basically this recipe consists of brownie batter topped off with chocolate chip cookie dough batter. It doesn't get any more simple than that. I'm not sure why they are called Chipsters as I feel that perhaps "brookies" would be more appropriate. Brownie+Cookie=Brookie..?! Any takers? Anyway, these were nothing special although still very tasty. The cookie layer on top thickens while baking creating a great rich cookie crust. I would have preferred the brownie layer to have been less dense/dry and more cake-ier but there was so much chocolate throughout that it kind of made up for it. I even added chocolate chips to the top. I would also most definitely pair these bad boys up with vanilla ice cream next time. Getting ready: Center a rack in the oven and preheat the oven to 350 degrees F. Butter a 9-x-13-inch baking pan, line it with wax or parchment paper and butter the paper. Put the pan on a baking sheet. To make the brownie batter: Put both chocolates and the butter in a bowl set over a saucepan of simmering water. Stirring occasionally, heat just until the ingredients are melted, shiny and smooth. If the mixture gets too hot, the butter will separate from the chocolates. Remove the bowl from the heat. 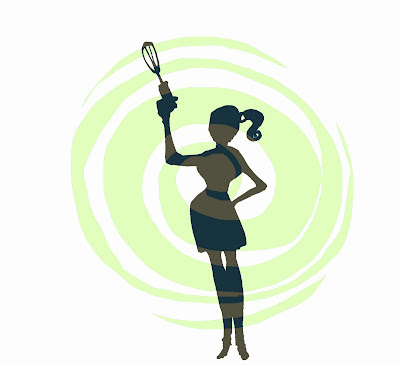 To make the cookie dough: Whisk together the flour, baking soda, and salt. OK, I've officially fallen off my rocker. I am so obsessed with the banana bread that I made last week, found here, that I absolutely had to make it again. My poor excuse: "I have several bananas that aren't going to be eaten and are at optimal ripeness for banana bread." Weak, I know. Anyway, moving on...Sooooooo, I decided to switch it up a little bit and make this baking venture a tad more interesting. I made the exact same batter as last week with only one exception; the amounts of mini chocolate chips that were packed into this batter was complete and utter insanity. I must have used 1 1/2 bags, as I didn't even measure because I was in crazy chip-happy mode. Rather than making loaves or using 9 inch round pans like last week, I decided to create mini muffins, medium sized muffins, and a bundt cake. Yes, I realize that seems like a whole lot, however, this recipe is HUGE and made enough for 12 mini muffins, 6 medium to large muffins, and filled an entire bundt pan. I also did not use the White Chocolate cream cheese icing. Instead, I created my own frosting which came out so creamy and delicious. It had a kick to it, as it consisted of nutmeg and honey, and it was the perfect compliment to the muffins. Mix butter, honey, cinnamon, nutmeg and vanilla until well blended and smooth. Add cream cheese and beat until smooth. Gradually add confectioner's sugar and beat until smooth and creamy. If you are looking for a looser type of frosting then add milk.